Since 1946, Theater of the Sea, has been providing quality swim with dolphin experiences for audiences in the USA and all around the globe. It is the second oldest marine mammal facility in the world. Its natural salt water lagoon was originally a quarry that supplied rock for Henry Flagler’s famous railroad which opened the Keys to the rest of the country in the early 1900’s. Today the lagoon is home to Atlantic Bottlenose Dolphins, California Sea Lions, Sea Turtles, Tropical and Game Fish, Sharks, Stingrays and other forms of marine life. Not to mention, over 17acres of finely manicured gardens also display many different exotic animals and wildlife, which are overall a great asset and cultural history to Theater of the Sea. The beautiful destination of Islamorada, a breathtaking island in the Florida Key, has many educational and recreational activities to participant in. If you are looking for things to do in Islamorda, Theater of the Sea is one of the island most famous attraction here on the island. There are many different types of swim with dolphins, swimming with sea lions and stingrays programs available. In the open salt water lagoons, you can experience the animals as close as possible to their natural habitat and for many that allure is simply too strong to resist to visit here. Yet another great aspect of the facility is its internship. Theater of the Sea volunteer interns work alongside animal care staff to feed and care for dolphins, sea lions, sea turtles, tropical fish, sharks, stingrays, and marine invertebrates. This is a great way to see if this career is for you. 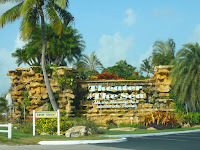 But within the protective arms of Islamorada, Florida Keys, Theater of the Sea has survived many tropical storms over the years. This attraction is assured to be around today and in the future for it's lovely animal inhabitants.